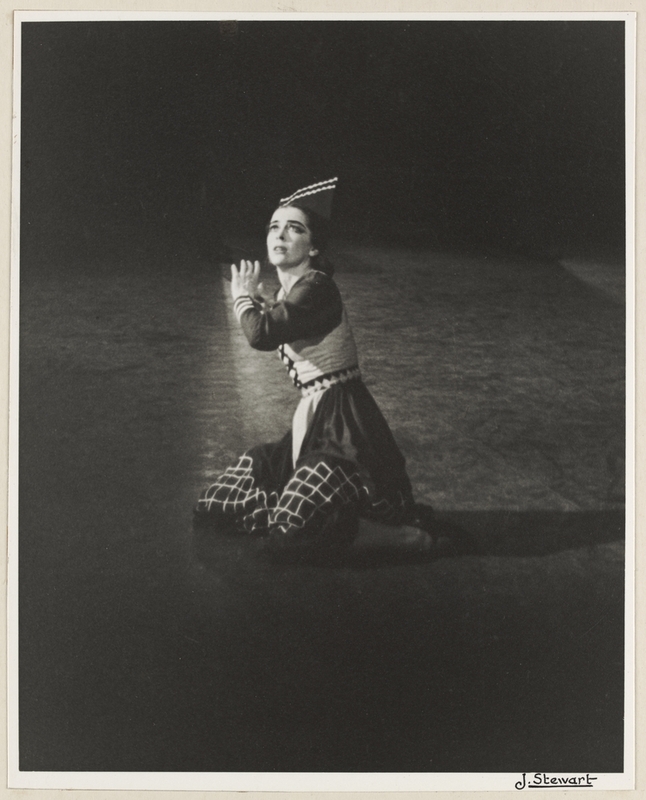 In 2015, photographer Jean Stewart (1921- ) generously donated to the Library an extensive collection of her photographs relating to the Ballet Guild, later known as the Victorian Ballet. Le Beau Danube, the Borovansky Ballet, His Majesty’s Theatre, Melb, 1946. 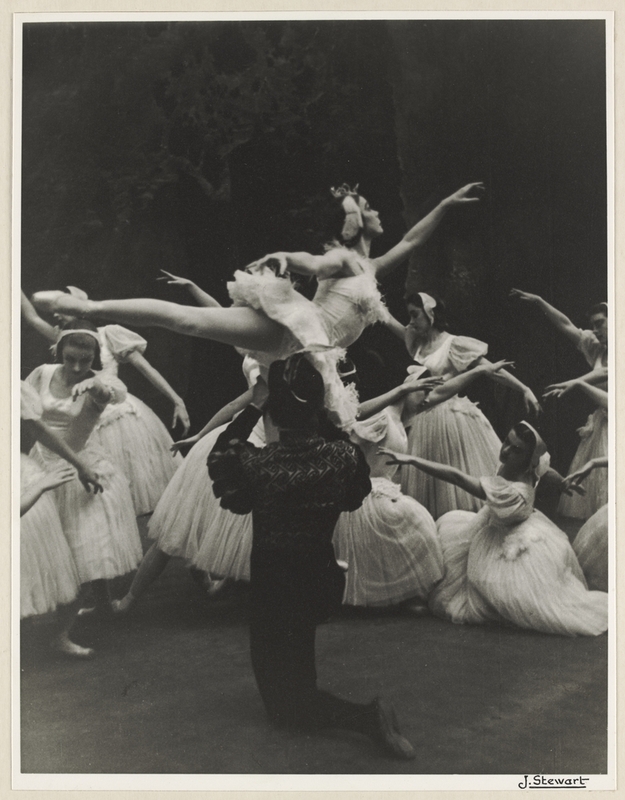 Swan Lake, Act II, the Borovansky Ballet, His Majesty’s Theatre, Melb, 1946. Jean Stewart was born in Melbourne in 1921. She studied photography at R.M.I.T. and worked for 48 years as a radiographer, but her main interest was ballet. 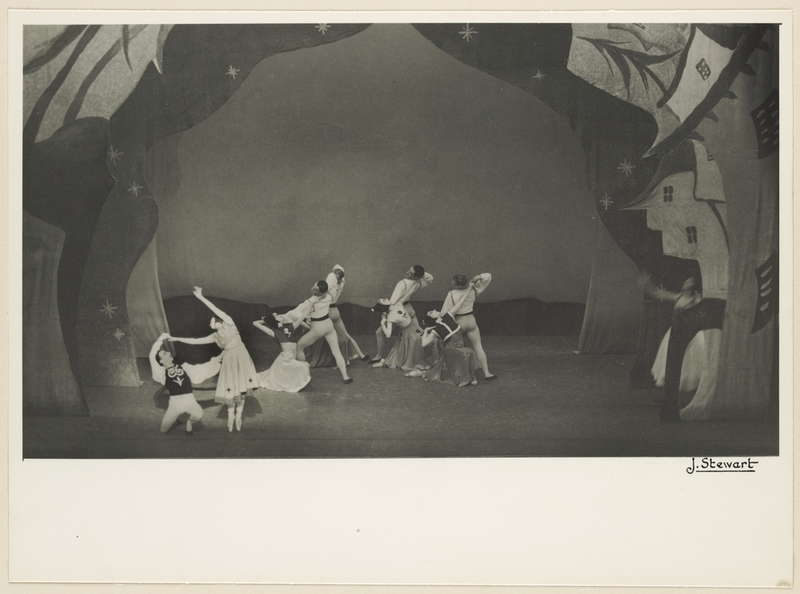 Her archive of ballet photographs (and Gilbert and Sullivan performances) dates from the late 1930s to the 1950s and includes productions of the Borovansky Ballet Company, the UK’s Ballet Rambert and whole seasons of the (Victorian) Ballet Guild. Jean Stewart was also Stage Manager for Laurel Martyn, founder of the Ballet Guild (later Ballet Victoria) , for ten years. 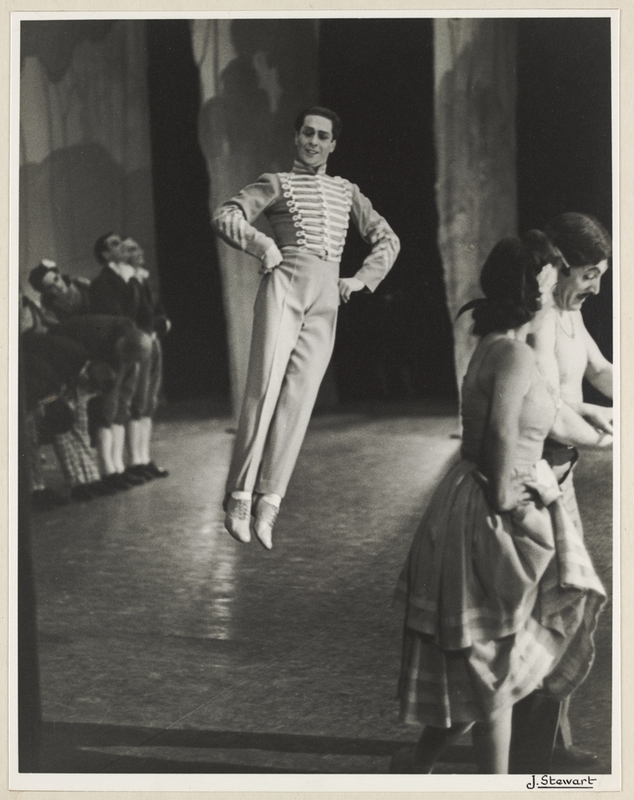 En Saga, the Borovansky Ballet, His Majesty’s Theatre, Melb, 1946. To establish some distance to shoot wide shots, Jean would sit in rows E and F in the dress circle at His Majesties Theatre, Melbourne, from where she could capture the whole stage. Her friends would often sit in front of her at the ballet and create shoulder space for her to shoot through. Anyone sitting next to Jean was asked not to clap as that would shake the camera on the unipod. Jean then went on to use a cable release to reduce any further vibrations. When Stewart first started taking photographs there were no single-lens reflex cameras (SLR) on the market in Australia. A SLR camera typically uses a mirror and prism system (hence ‘reflex’ from the mirror’s reflection) which allows the photographer to look through the lens and see what the camera will capture. This was contrary to Jean’s viewfinder camera where the image could be significantly different from what was captured. 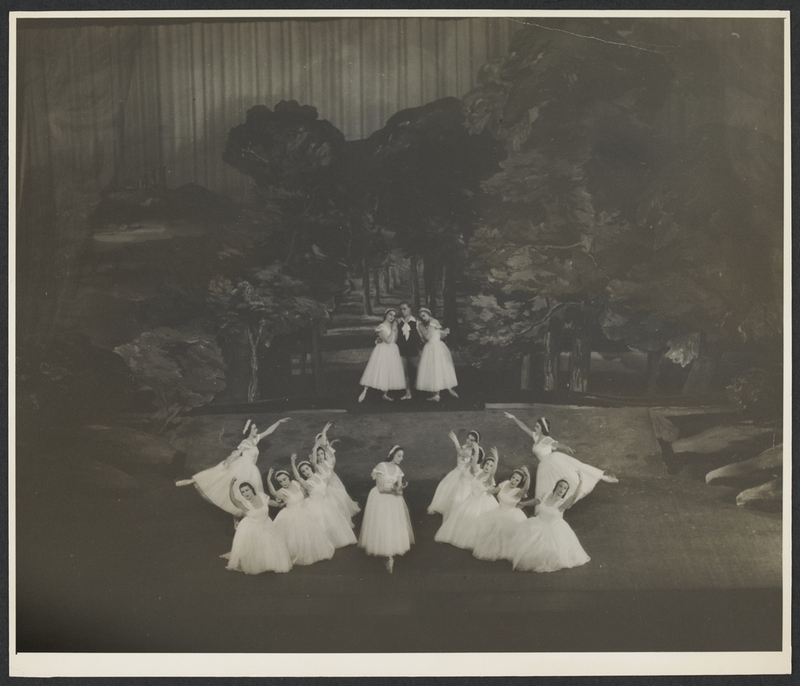 At first Stewart used sheet film (H2015.220/1) to shoot the ballet. The sheets would be loaded into a film holder (H2015.221). Holders (which contained 10 or 12 films) were loaded and unloaded in the dark to protect film from premature exposure. 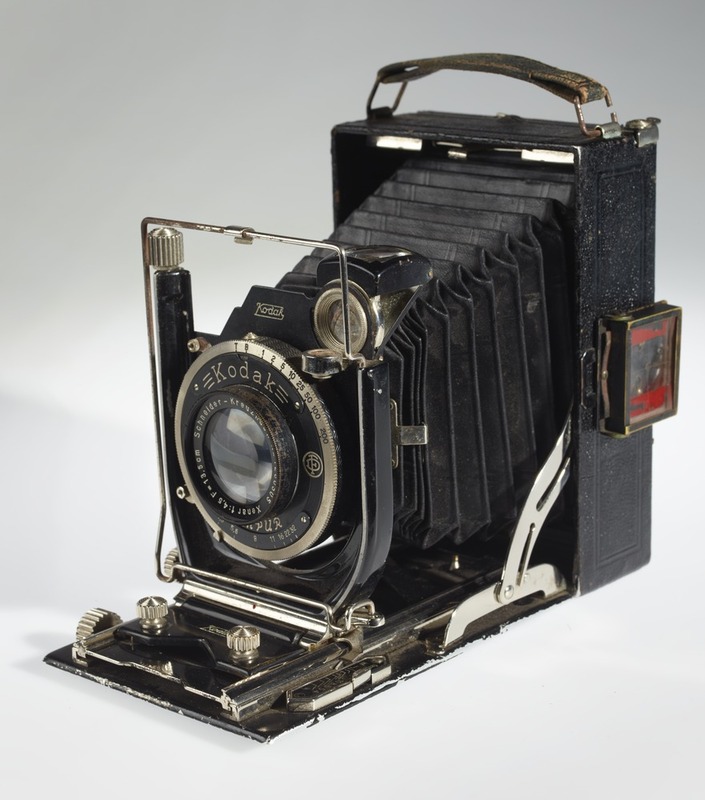 The holder was inserted into the camera back on site and the dark slide (which protected the sheet film from light) was removed from the holder. The exposure was made, the dark slide replaced and the film holder was removed from the camera and replaced with a new holder of unexposed film. Shooting with sheet film was time consuming and limited in the number of film exposures available. After a short time Jean had the camera adapted to take a film back of interchangeable 120 roll film. Not dissimilar to an adapted Autographic camera bed and 120 film holder (H2015.222) that she also kindly donated to the library. Jean would calculate the camera settings prior to the show by sitting in on rehearsals and then shoot the live performance with the pre-existing camera settings. The lens was set to its widest aperture to capture the maximum light from the whole stage. She knew the ballets very well and could therefore select her shots at still moments in the performance in order to have minimum movement. This was the only way to achieve sharp images. Jean used several techniques in the darkroom to enhance the live shots of the Ballet performances. For instance she used dodging and printing-in (also known as burning-in) to compensate for overexposed or under lit areas of the print. Coppelia, the Borovansky Ballet, His Majesty’s Theatre, Melb, 1946. Dodging is where light is held back from areas that would otherwise print too dark. Dodging tools could be made from wire, black tape, and dark paper or cardboard. When the photographer used these tools, they always kept them moving or vibrating so that you wouldn’t be able to see a sharp line on the finished print, indicating where they dodged. Enlarging the negative in the darkroom and cropping the print. In smaller theatrettes often shows were sold out and photographs could only be taken during rehearsals. In this instance all shots were taken full-stage and close-ups were created using the enlarger in the darkroom post shooting. As Jean Stewart did not use a flash nor had the technology of a zoom or telephoto lens, one way for her to capture close up shots was to get physically closer to the subject and shoot the performers during rehearsal. Laurel Martyn and Martin Rubinstein in ‘Blue Bird’, Ballet Guild, Union Theatre, 1947. Stewart printed from black and white negatives that she processed in the darkroom working with various films. She printed with gelatin silver photographic paper, varying the look of photographs by printing with a range of surfaces, including pearl, matte and glossy. 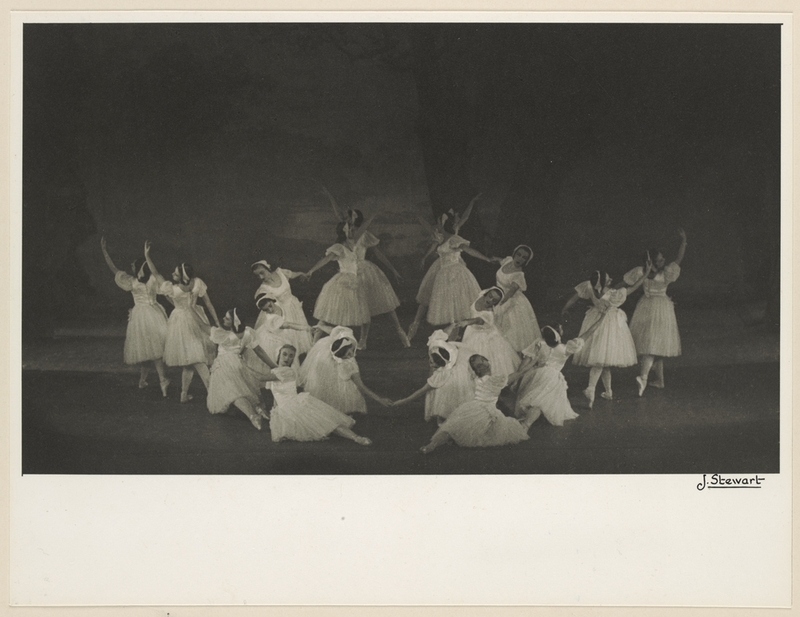 Jean Stewart utilized the available photographic technology of the day and consequently produced highly atmospheric and moody images of the Borovansky Ballet and the Ballet Guild, later renamed Ballet Victoria. Chamberlain, Katherine McFarlane. Darkroom handbook: [Twenty-four actual experiments for beginners in printing, developing, lighting, enlarging and other fundamental photographic processes] , 1947 Chicago: Ziff-Davis. Susan Long is a visual artist, librarian and an archivist working in the Pictures Collection at State Library Victoria. She has a particular interest in the photographic archive as a key site through which historical knowledge and memory are collected and reinterpreted. Lovely and informative post. Thank you Susan. Would *love* to see an exhibition of these photographs! I know this is late, but the best dodging and burning tool is actually your hands. You can make all sorts of shapes instantly to fit whichever part you’re trying to burn or dodge – much faster than making wire or cardboard the right shape each time!